Discount Magic - Clear Fourcing Bag. How often have you come across excellent magical effect that depend on the force of a card or word or number etc. Usually, the instructions suggest you use 'your favourite method'. Now, the 'Clear Force Bag' will solve the problem. This special bag made out of heavy weight transparent vinyl plastic, 8" wide and 12" long is large enough for stage use. 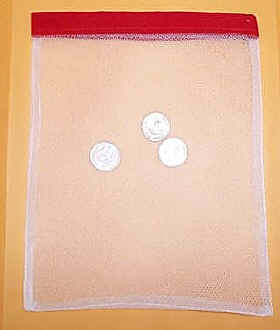 The bag is used like a change bag and scores of effects are possible with this transparent bag. Comes complete with detailed instructions and over a dozen ideas for it's use to start you off.